Assembly is simple, and each adjustable bar stool provides your dining room or kitchen with stylish seating. With their swivel design, the stools offer you the versatility you need for your home.Cross-back design Swivel stools. The bar stools have cushion seats. Constructed of metal, microfiber fabric and foam. Brand:Avery. Overall dimensions: 19"L x 15.75"W x 43"H. Legs are adjustable to either 24" or 29". The Barstool Height Metal Adjustable Avery set includes elegant counter stools that each feature a cross-back design and swivel seat. 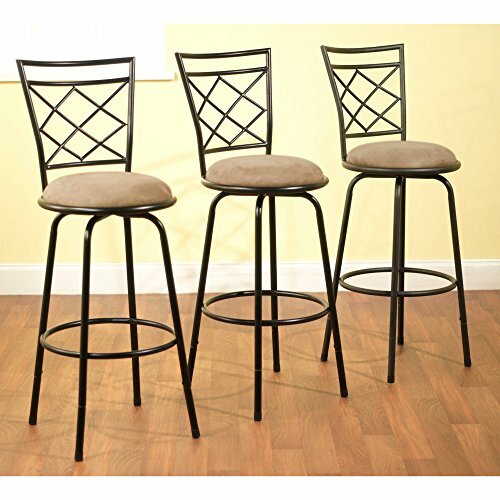 Each bar stool also features a foam cushioned seat for long-lasting comfort. The legs can be adjusted to either 24" or 29" so that you are sure to find the right fit for your space. If you have any questions about this product by AMA shop, contact us by completing and submitting the form below. If you are looking for a specif part number, please include it with your message.